Donald Trump Says He'll Pardon Dinesh D'Souza : The Two-Way President Trump said the conservative commentator was "treated very unfairly by our government." He also said he is considering pardons for Martha Stewart and former Illinois Gov. Rod Blagojevich. 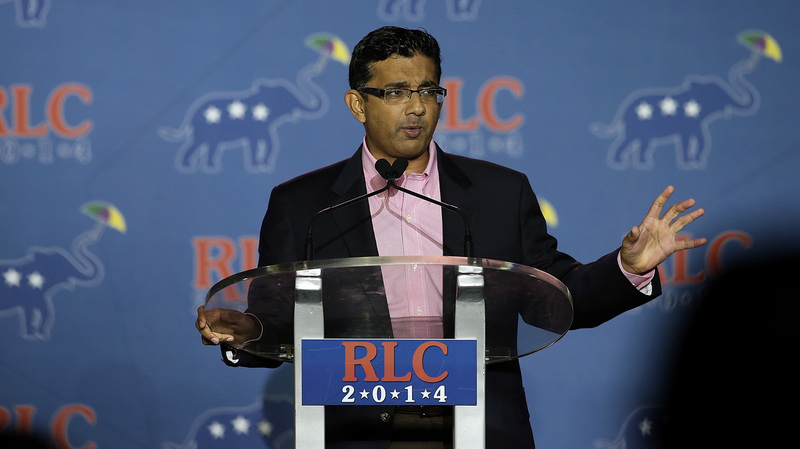 Conservative filmmaker and author Dinesh D'Souza speaks during the final day of the 2014 Republican Leadership Conference on May 31 of that year in New Orleans. Earlier that month, he had pleaded guilty to campaign finance fraud. President Trump has pardoned conservative commentator Dinesh D'Souza, who pleaded guilty in 2014 to making illegal campaign contributions in other people's names. On Twitter on Thursday, Trump said D'Souza was "treated very unfairly by our government." The White House later issued an official statement saying D'Souza was, "in the president's opinion, a victim of selective prosecution" — an opinion that was roundly rejected by a federal judge when D'Souza was sentenced. The White House also noted that D'Souza "accepted responsibility for his actions" and completed community service. D'Souza has been an outspoken supporter of President Trump. This is the fifth pardon of Trump's presidency. He told reporters on Air Force One on Thursday that he is considering using his clemency power in other high-profile cases, as well. He said he is weighing a pardon for Martha Stewart, who served time for conspiracy and lying to federal investigators but has been free for more than a decade. Trump said she was "unfairly treated" and "used to be my biggest fan in the world." Trump said Blagojevich was put in jail "for being stupid and saying things that ... many other politicians say." He also noted that Blagojevich is a Democrat. "I don't know him other than that he was on The Apprentice for a short period of time," Trump said, referring his former reality TV show. Blagojevich was a contestant on Celebrity Apprentice in 2010. D'Souza is a best-selling author and successful filmmaker who served as an adviser in the Reagan administration. He's also a prominent Christian activist; he used to be the president of a Christian college but resigned after he became engaged to one woman while still married to another. He is also a former commentator on NPR. In 2014, when he was charged with violating federal election campaign laws, D'Souza alleged that he was the victim of selective prosecution, targeted for his conservative beliefs. He had been sharply critical of Obama, whose administration prosecuted him. A judge rejected that defense, calling it "all hat, no cattle." Then-Manhattan U.S. Attorney Preet Bharara, who prosecuted the case, emphatically denied any political motivation. "As our office's record reflects, we will investigate and prosecute violations of federal law, particularly those that undermine the integrity of the democratic electoral process, without regard to the defendant's political persuasion or party affiliation," he said in 2014. "That is what we did in this case and what we will continue to do." D'Souza ultimately admitted to donating tens of thousands of dollars to a U.S. Senate campaign, well above the individual contributions limit of $5,000, by funneling money to other people and donating in their names. As part of his guilty plea, D'Souza admitted that he "knew what he was doing was wrong and something the law forbids," the U.S. Attorney's Office for the Southern District of New York said in a statement. D'Souza was sentenced to five years of probation, including eight months' confinement in a community center. New York Attorney General Barbara Underwood blasted Trump's pardon of D'Souza. "President Trump is undermining the rule of law by pardoning a political supporter who is an unapologetic convicted felon," Underwood said in a statement. Kardashian West tweeted after the meeting that she hopes Trump will act on Johnson's case.